After a long winter, we welcome the arrival of Spring. From the trees coming into bloom to tulips to sunnier days, it signals renewal, growth, expansion. We’re inspired to start cooking differently with the arrival of gorgeous produce at the farmer’s market and supermarket that practically shouts “fresh, healthy, light!” Asparagus, peas, artichokes, baby lettuces, fava beans, rhubarb, and apricots all call out for recipes that put them front and center. We’ve rounded up nine of our favorites. Give these plant-based menopause-friendly receipts and try and let us know which is your favorite or share one of your own recipes! 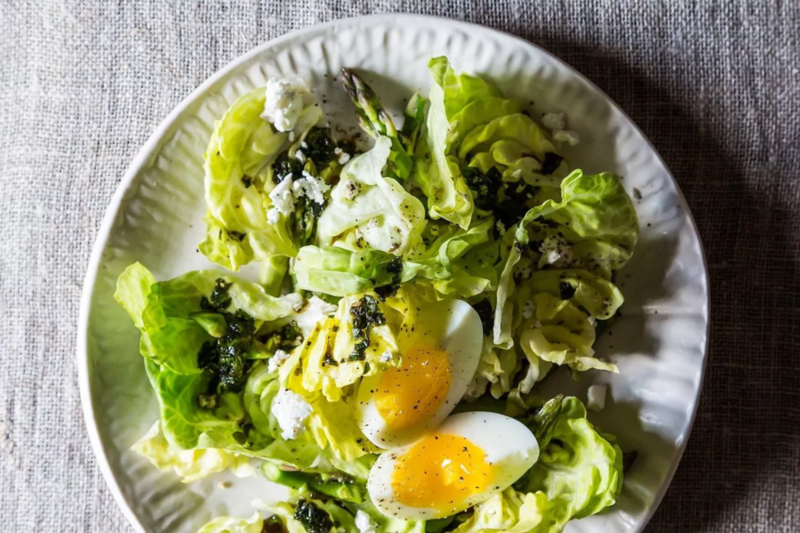 Asparagus is the star of this delicious recipe by Girl Farm Kitchen. Try to find fresh, crunchy lettuces. You can serve this salad as a side dish or scale it up for a main dish. You don’t have to be a vegetarian to love this recipe by Josh Cohen. The beans make it a hearty enough for a main or you can add a more substantial protein. Chicken, sausage, or lamb would make a great complement. Spring garlic is a genius ingredient. Basically, it’s young garlic before the bulb has fully matured. Look for it at your farmer’s market or shops that carry local produce. This simple recipe by Erin McDowell comes together in minutes. Serve these herb packed fritters with Tzatziki sauce for a Spring hors d'oeuvre or side dish. This recipe from Bon Appetit comes together fast and you can riff on the herbs to change it up. Nothing says Spring like deviled eggs. This recipe was adapted from the Country Egg, City Egg cookbook, a book every egg lover should own. It’s a tried and true crowd favorite. Make extra to have on toast the next day. Delish! 1. Peel the eggs and slice them in half lengthwise. Remove the yolks and place in a small mixing bowl. 2. Blend the yolks with the mustard, cream, vinegar, shallot, chives, tarragon, salt and pepper. You will likely need to add more cream to get the consistency you want. 3. Fill eggs with mixture. You can hard boil and separate the egg yolks from the white the day before or in the morning. The filling can be made the day before or in the morning. You will need to add a little more cream and adjust the seasonings just before filling the eggs with the mixture. The unusual combination of ingredients doesn’t sound as good as it tastes. This Food52 recipe uses the best of Spring herbs and strawberries and is light and substantial at the same time. It’s a perfect dish for brunch or lunch. Fresh creamy peas make a delicious base for buttery cod or other white fish. This recipe from Fish: Recipes From the Sea leaves some of the peas whole for a lovely texture and contrast to the creamed peas. This unusually named dish is from Unforgettable: The Bold Flavors of Paula Wolfert’s Renegade Life our favorite cookbook of 2018. The recipe takes time to make but is sublime and perfect for the vegetarians at your table. You’ll want leftovers as it tastes even better a day or two later. This risotto recipe from The Dog’s Table highlights so many Spring vegetables - herbs, peas, asparagus - and the shrimp is a light, healthy complement that doesn’t overwhelm the stars. What are your favorite Spring recipes? Join us on social media and let us know! Looking for more tips on healthy eating and weight loss? Join us over at Lisa Health.